We skipped last week’s Friday 5 in honor of Thanksgiving. Now we’re back with the first all-soccer Friday 5 in honor of today’s World Cup Draw from South Africa. So far all we know are the teams who won’t be playing the United States in next Summer’s competition, which are Australia, Japan, Korea DPR, Korea Republic, Honduras, Mexico and New Zealand. These are things we had already assumed but are now official. 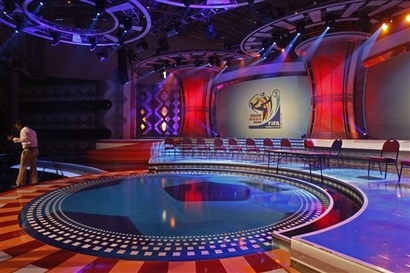 The top seven seeds plus the hosts will be placed at the top of each of the groups and the rest are divided into separate “pots” based on location. You can read about it here. Each tournament there is the “Group of Death” which contains one of the top contenders plus the first team left out of the top flight and a decent team from one of the other pots. Four years ago, the US had the privilege of playing 3rd ranked Czech Republic, the eventual champions Italy, and African upstart Ghana. Hopefully, that doesn’t happen again. Anyway, I’ll be counting down what I feel are the Top 5 Contenders for the FIFA World Cup. USA opened their 2009 Confederations Cup schedule against the current World Cup holders, Italy. Unfortunately, they were only given a fair shot for 33 minutes. That’s when the referee sent US midfielder Ricardo Clark to the dressing room for a silly tackle on Genarro Gattuso. No one would argue that it wasn’t a foul or a yellow card, but a red card was way too stiff of a penalty. In my opinion, Clark was one of the best players on the field for the Americans in their last game against Honduras and through the first 30 minutes of today’s game. His sending off changed the entire complexion of the match. Italy would go on to win 3-1. I’m not going to try and argue that the USA should have won, but Italy didn’t need the help and it was unfortunate that they got it like that. Day three at the European Championships brought about some surprises. It was “The Group of Death,” or Group C’s turn to show their skill. I was able to get the games while at work, but couldn’t watch them straight through. My boss probably wouldn’t have liked that. The first game was between France and Romania, which ended in a 0-0 tie. The French missed Thierry Henry’s presence up front. The one thing I really remember about the game was that Karim Benzema really should have put away a second half chance and given the French the 3 points. One sidenote is that France’s Lilian Thuram became the first player to ever play in 15 European Championship games, which is quite a feat. The second game of the day between the Netherlands and Italy produced the shocker. It wasn’t so shocking that the Dutch were victorious, it was the very decisive 3-0 scoreline that got everyone’s attention. I didn’t think Italy was being outplayed that bad until Ruud van Nistelrooy’s 26th minute strike. I thought he was clearly offside, but I missed the injured Italian player, Christian Panucci, laying on the sideline. Apparently, that’s good enough to qualify as being “in the play” and the goal stood. Right after van Nistelrooy’s goal, the Italians looked for an answer off a corner kick but Giovanni van Bronckhorst cleared it off the line and started the most perfect counter attack I’ve ever seen. Van Bronckhorst ran 70 yards to give the initial cross that was headed down by Dirk Kuyt and finished superbly by Wesley Sneijder. Italy only gave up two goals in the entire 2006 World Cup, so obviously they missed the presence of center back Fabio Cannavaro. Van Bronckhorst deservingly got his name on the scoresheet with a header with about 10 minutes left. It was another clinical counter attack, finished off by the dwarfish van Bronckhorst. It was the best performance of the tournament so far. Holland is looking good for the second round after the morning tie between France and Romania. As for Italy, I’d hate to be Romania who will get the full wrath in their next game on Friday. Today, Spain gave the Dutch a run for the best looking team when they thrashed Russia 4-1. David Villa scored the first hat trick in European competition since Patrick Kluivert did it against Yugoslavia in 2000. His goals were set up perfectly by Fernando Torres and Iniesta, all he really had to do was tap them in. His third goal had a little more individual effort, but was still set up by a great ball from Cesc Fabregas. The Russians pulled one back late and Fabregas got a garbage goal of his own. The Spanish looked fantastic today. They changed their formation after only scoring a late goal against the United States before the tournament. This allowed David Villa to crack the starting lineup; there were doubts that he would play against the Russians. He responded to this by netting at hat trick…I think he’ll be in against Sweden on Saturday. In the nightcap Sweden downed the holders Greece 2-0. Greece threw their defensive play at the Swedes, putting seven or eight men behind the ball at all times. Sweden really had no space to move in the first half and looked awfully frustrated to me. It looked like we were headed for a second 0-0 tie when Zlatan Ibrahimović lashed a ball into the top corner of the net in the 67th minute. It gets my early vote for goal of the tournament. Petter Hansson scored what gets my vote for the worst goal of the tournament five minutes later and the Swedes got all three points. Both of these teams will have to step up their game in order to take on Spain, who looked like the title contenders everyone predicted. Sweden put themselves into a great position to go through, with a victory over Spain or Russia. I doubt any surprises come out of this group.